How To Catch The Biggest Wave In The Universe An L-shaped machine in Louisiana is hunting for some of the most powerful waves in existence: gravitational waves. This wave detector acts like a giant tape measure to capture bends in space and time. The Laser Interferometer Gravity-Wave Observatory looks for tiny changes in the length of the structure's 2.5-mile-long arms. There are two detectors: one in Washington state and one in Louisiana (pictured). This photo was taken before severe flooding that has deluged a large part of the state, including where the observatory is located. Officials there report the detector is fine. To find out, I went to see where the detection finally occurred. It's just off Interstate 12 in Livingston Parish, La. To get there you head through town, past the "Gold and Guns" pawn shop and up a country road. Turn onto an empty lane and eventually some low buildings emerge from a forest of gangly pine trees. 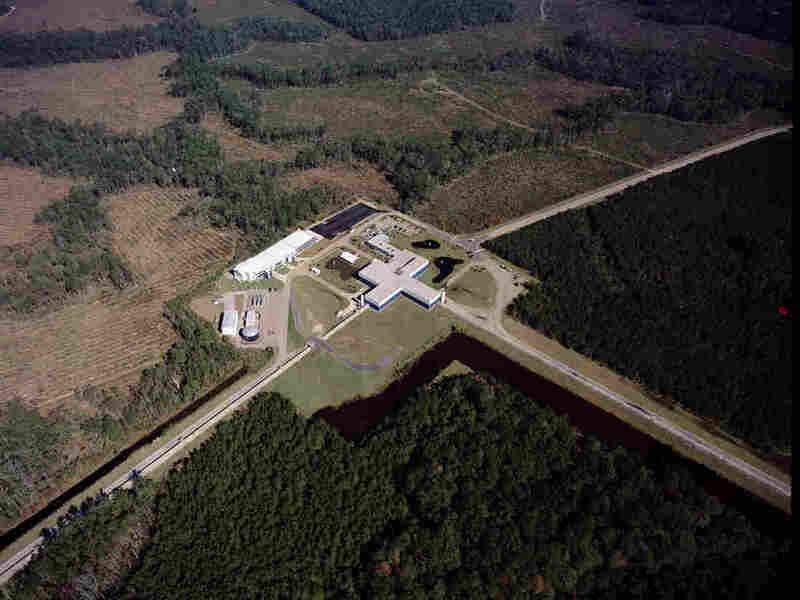 This is the Laser Interferometer Gravitational-Wave Observatory. That's kind of a mouthful, so scientists just call it LIGO. Physicist Joe Giaime of Louisiana State University in Baton Rouge runs this detector. He says measuring waves in space-time might sound complicated, but the basic concept is pretty simple. "The thing we're measuring is length," he says. "Everybody kind of knows what length is." Because gravitational waves warp space, they literally change how long things are. LIGO is basically the world's most complicated tape measure. We walk up a little hill overlooking the machine. A drab concrete pipe stretches off toward the flat Louisiana horizon. Giaime explains that this is one of the LIGO's two arms. The machine is in the shape of a giant letter L. When a gravitational wave passes by, one arm of the machine gets a little shorter and the other one gets a little longer. The machine measures the difference in length. And that's all there is to it. In practice, making those measurements is a lot tougher. By the time gravitational waves get to Earth, they stretch and shrink dimensions by less than a thousandth of the width of a subatomic particle. And on Earth there are lots of bigger waves that can drown them out — seismic waves from earthquakes, for example. A big quake anywhere on the planet can set the whole machine shaking. "We just stop and wait it out," Giaime says. This machine is so sensitive that it can feel the vibrations from passing trucks, falling trees and even storms in faraway oceans. 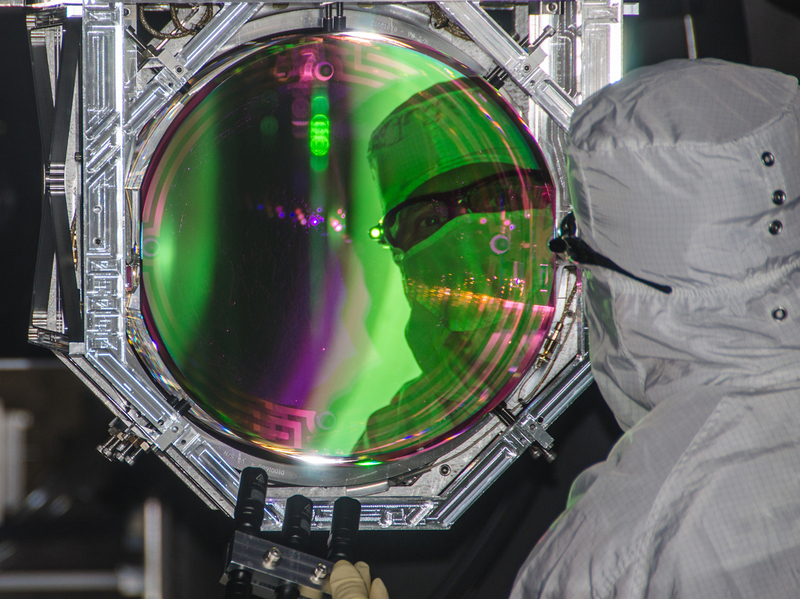 Lasers and mirrors are used to carefully measure shifts in space-time. To avoid contamination, protective clothing must be worn at all times. Overcoming all this background noise is the real trick to LIGO. To see how that works, Giaime and I hop into his car and set off on a road alongside the concrete tube. As we drive, he explains that inside the tube is a laser. The laser beam travels 2.5 miles to the end of the tunnel, where there's a mirror. The narrow beam of light then bounces off the mirror and goes back. In this way, the laser constantly monitors the length of the tube for any space-time distortions. At the end of the arm, there's a little building with the mirror inside. We head in. We have to wear hair nets and booties over our shoes because these mirrors are perfectly adjusted and carefully controlled. "Contamination can ruin all those things," Giaime says. After donning our protective gear, we walk through a second door into a room with a big steel tank. The mirror is inside. It hangs in a vacuum, isolated from the noisy world, just waiting for a gravitational wave to stretch the tube. The search started more than a decade ago. But for a long time, LIGO didn't see anything. "Up until last year, we would give tours to little kids, and at the end of the tour, they would say, 'So what have you seen, what have you measured?' " Giaime says. "And the answer was, 'Nothing! Nothing yet.' "
Giaime began to get nervous. "I can personally say I was wondering if there was some sort of misunderstanding about what was out there in the universe," he says. But he and the rest of the team kept at it. Upgrading the lasers and tweaking the mirrors. Finally, on Sept. 14, 2015, at 5:51 in the morning, a wave passed through this detector and the machine vibrated — like a giant tuning fork listening to space and time. By converting the gravitational wave signal into sound waves, researchers can hear the collisions of black holes. Moments later, an identical detector in the state of Washington picked it up, too. The signal was real. It was all that was left of the massive wave created when two black holes collided billions of years ago. The wave is small now, but at the moment of the merger, the power released was greater than all the stars combined. It truly was the biggest wave in the universe. Science reporters at NPR are exploring all sorts of waves this summer. Find more of our favorites here.